RED BLUFF, Calif. - Red Bluff resident DeeDee LaChance has a heart for troubled youth and children in the foster care system. In order to help counsel them, she attended Simpson University’s School of Adult Studies, ASPIRE program, to earn her B.A. in psychology. On Jan. 11, LaChance was one of 195 students who received their college degrees during Simpson University’s winter commencement. 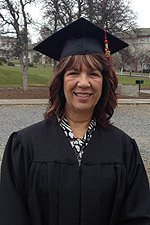 LaChance faced obstacles while earning her degree. In order to fund her education, she had to take money out of her IRA. She also struggled with a medical issue that affected her academic progress. Despite these struggles, LaChance persevered and completed her degree. She said she enjoyed many aspects of the ASPIRE program, including going to class in the evening and praying before class. One of her favorite things about the program was her professors. A combination of things motivated LaChance to earn her degree. Before going back to school, she worked as a travel agent and spent time with her twin grandsons. As the economy went downhill and her grandsons got older, she said she realized it was time for a change. Her volunteer work with youth at the juvenile hall in Red Bluff also factored into LaChance’s desire to earn her bachelor’s degree. “I had a strong desire to be able to counsel them, but without that degree I knew it was impossible, so I got serious about pursuing higher education,” she said. Now that she has finished her degree, LaChance is writing a non-fiction story about part of her life. She hopes the story will be in print by June of this year. LaChance is also going to work as an advocate for foster children through a program called Court Appointed Social Advocates (CASA), which she spent nine years working to bring to Tehama County. She first got involved in the program when she lived in the Monterey Peninsula and worked with CASA as a volunteer. If her health and finances allow, LaChance would like to earn her master’s degree. “If I were to get my master’s, I would work with the youth of my community to make a difference in their lives,” she said.